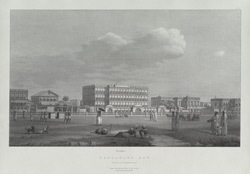 This lithograph derives from plate 5 of William Wood's 'Views of Calcutta'. The Bengal Club was founded at Calcutta in 1827. At the time this image was produced the club was housed in Gordon's Buildings in the middle of Esplanade Row. It moved to Tank Square around 1830 and subsequently purchased the house in Chowringhee Road formerly occupied by Thomas Babington Macaulay. The Bengal Club is still in existence at this site.